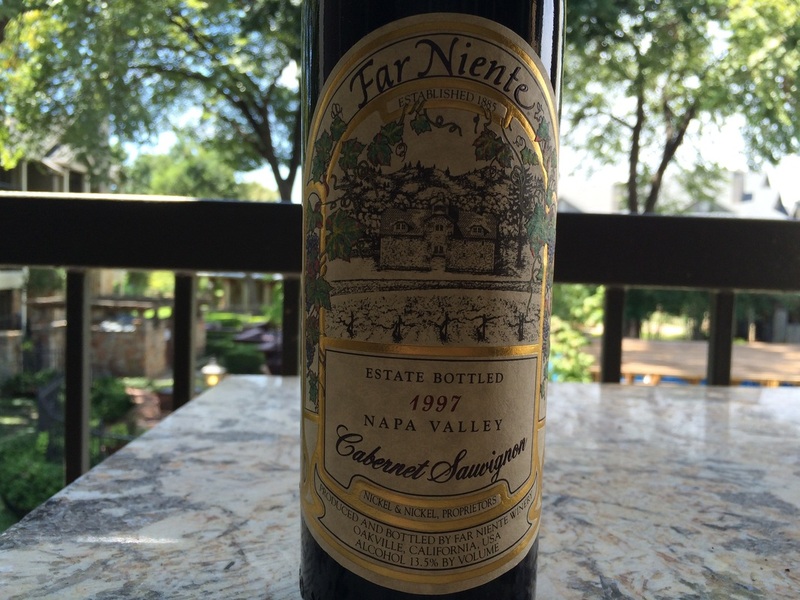 Bon Vivant Gourmets - Far Niente Cabernet Sauvignon 1997 - perfectly aged! The Bon Vivant Gourmets have been fans for decades of ﻿Far Niente﻿, (links to a review of the '95, perhaps one of the last bottles in the world from that vintage) a winery that needs no introduction. Once or twice a year, we like to go deep into the cellar, pull out all the boxes until we get to that secret dust covered spot way in the back where its dark - where the secret stash is hidden away - and pull out a wine that not even the winery has available. It is a sincere honor to have this luxury, to consume a wine that has long since been gone. Where were you in 1997? How do you remember the world? Such a wine is deeply revered and it's difficult not to think about all the years that have passed, all thing things that have changed, and how different life is since the vintage listed on the label. There is a feeling in the air, one of bewilderment and anticipation, one that even attracts the attention of animals - much in the opposite way of them fleeing before an impending environmental event - such a wines draws them and captures their attention. Thus was the case with this kitten, who began circling the table, as if a fluttering fairy were floating just above it. The Martin Stelling vineyard was planted in 1978, thereby making the vines used for this wine nearly two decades old. Wines made from older vines take on a softer and more elegant style than those from younger vines. They become more and more delicate and complex as the vines age, hence offering higher quality and much more graceful wines than those from younger vines. Most vines begin producing world class, elegant wines worthy of higher price tags after 15 years and become nearly economically unviable after 50 years of age as older vines produce fewer grapes (but those few grapes they do produce are intensely concentrated and some of the most complex in the world). The weather in 1997 was perfect and declared the vintage of the decade (some debated regarding the '94). Benchmark would write: An early spring followed by a cool, even summer had winemakers smiling throughout the valley all the way through July. A warming trend in late August and early September put a punctuation mark on the season, accelerating the fruit to ripeness. A very large crop of rich, opulent fruit was the result, producing some of the biggest wines of the decade. If you enjoy larger-framed, fruit-forward wines, 1997 is your vintage. Many wines are still quite young, but the prevailing modern style of many allows for early drinking. At it's release, the Wine Advocate wrote: The wine displays the typical cassis and blackberry notes along with spicy oak aromas that have become synonymous with the Far Niente "house style." Time enhances the flavors and nurtures the bottle bouquet, offering elegance, and earning Far Niente the reputation for creating age worthy wines. When young, the wine will age for 18-20 months in 75% to 100% new French oak barrels. During this time, rackings are carried out every three months to remove the clear wine from its sediment. After a full year in the barrel, a gentle fining with egg whites further softens and clarifies the wine. The result is classically structured Cabernets that are soft in texture, rich in flavor, complex and long. The nearly dark purple opaque hues noticed in its youth have faded to a romantic ruby with only the slightest amber/brown tints around the edges: a common and tell-tale sign of a properly matured wine of quality. Tannins in the wine turn to sediment over time, which is why many older bottles kept on their side have a dark muddy streak along the gravity facing side of the bottle. Sometimes, with extremely well aged wines, the tannins turn to such a finite sediment, that a sand-like sediment may gather at the bottom of a glass (as opposed to often much larger chunks found in young, unfiltered wines, especially with those of France's Rhone valley). We used a Riedel's Sommelier series Burgundy wine glass (designed for softer Pinot Noir styled wines and purposefully not the Bordeaux series, which is designed for stronger Cabernet based wines) to expose the softer elements of the age, and as the wine was poured, a wafting aroma filled the air. With a deep inhalation, sweet cassis, plums, dates, figs, and hints of milk chocolate covered blueberries filled the nose. The spicy oak aromas mentioned in the wine advocate have completely faded leaving a more earthy, almost European sense of terroir deep in the back of the nose. In the mouth, the softness of silk and satin is immediately felt followed by the balanced commingling of fruit and earth into a subtle and sublime element only achievable with time. Faint mushrooms, dried earth, and cassis blend together to create the sensation one would feel when visiting one's grandfather as a child. Whatever oak or pencil shavings once present in youth are now completely gone and the result is a very mature wine of grace, elegance and refinement. A long lingering finish was timed at more than 45 seconds and it is recommended to decant about an hour before consumption.